Budgeting doesn’t have to be hard. In fact, the easier you can make it for yourself, the more likely you’ll be to stick with it. So let’s abandon the image of budgeting as some number-crunching, self-denying ordeal and instead look at some ways you can make it as easy as possible. 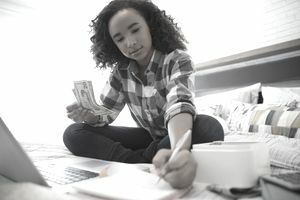 The following 10 tips will help you stay on track and adhere to your budget month after month, without feeling deprived or stressed out. Stop worrying about what’s due when and set your bills to automatically deduct from your checking account each month. No more invoices to track, checks to mail out or late fees to deal with. Whether you opt to use budgeting software, an Excel spreadsheet, or the envelope system, choose the budgeting system that feels the most intuitive and understandable to you. The easier it is for you to use it, the more likely you’ll be to stick with it. Having trouble remembering to keep every single receipt so you can track your spending? Then, round up your purchases to the nearest dollar instead. If you know you spent $5-something on a coffee and pastry, just enter it on your budget as $6. This will ensure that any mathematical errors are in your favor since you’re technically budgeting for more than you spent, and it will drastically reduce the headache factor of tracking every single cent. Most months, something winds up happening that busts your budget, whether it’s a mechanical problem with your car or that present you need to buy for your friend’s birthday. Give yourself some wiggle room in your budget by planning for unexpected expenses. In addition to your regular savings, establish an “unplanned expenses” fund you contribute to each month. This will cover any sudden costs that crop up without sending your budget off the rails. Things change from month to month. Our electric bill winds up higher than we expected it to be, or we inadvertently spend more at the grocery store than we meant to. Life happens, and we make mistakes. It’s not the end of the world. All you need to do is make adjustments as you go. If you go over in any one budget category, find ways you can shave some dollars off another. Maybe you can skip that meal out this weekend or get creative with leftovers so you can make your groceries last longer. Don’t consider an overage a game-ending mistake; find a way to make it work and press on. Spending goals don’t do you much good if you can never remember what they are. Don’t leave that budget at home when you go shopping. Take it with you to remind yourself of how much you have for each category and how much you’ve spent so far this month. With the plethora of budgeting apps and cloud storage options available, it’s easier than ever to access your budget right on your smartphone. It’s easy to feel discouraged when your budget leaves no room for a little happiness in your life. Even little splurges, like a trip to the movies or a candy bar from the checkout aisle, can help keep your spirits up and prevent you from resenting your budget. Allow yourself a little fun money, guilt-free, even if it’s only $10 to $20 a month. Rather than seeing your budget as a bully telling you what you can and cannot do, try looking at it as a personal challenge. Set yourself goals like coming in $10 under your entertainment budget this month, finding as many free entertainment options as possible, or seeing how much you can shave off your cell phone plan with a little customer service negotiation. Not only will you improve your budget each month by doing this, but you’ll add in a little fun factor to make it interesting. When things get tough or stressful, remind yourself of why you’re doing this in the first place. A budget can allow you to save up for your big goals, reduce your debt so you can get out of that job you hate, keep a cushion that gives you peace-of-mind, and afford the lifestyle of your dreams. It can be easy to lose track of this in the day-to-day work of minding your spending. Keep a reminder of your overarching goals to motivate yourself so you can start seeing your budget as a positive rather than a negative.